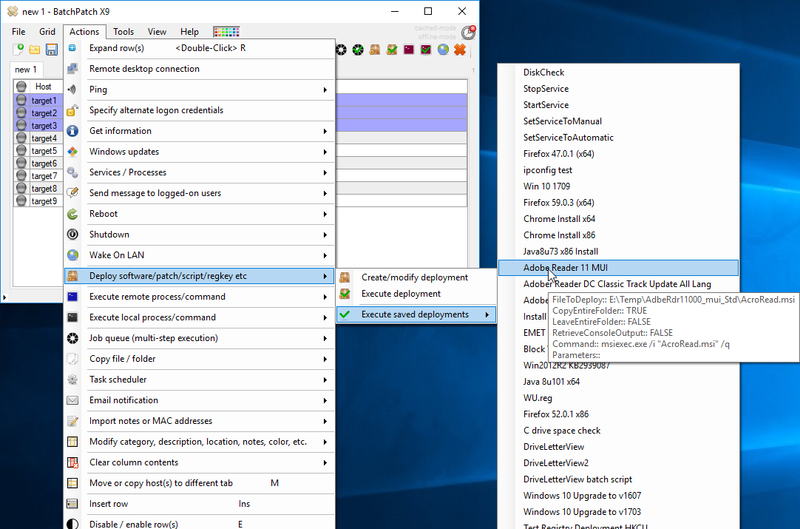 If you’re new to BatchPatch you might be aware of how easily it works to download and install Windows updates across your entire network of computers, but did you know that you can also use BatchPatch to deploy third-party software packages and updates? Almost any software can be deployed by BatchPatch, but in order to do that you need to first determine the silent/quiet installation parameter(s) for the 3rd-party package that you are interested in deploying. This is really the key ingredient to successful deployments. Today I’m going to discuss this in more detail. What is a silent deployment? Normally when you install a software package manually you first download (or obtain through some other means) the software package in question, which typically comes in the form of a setup.exe file. The package may or may not include additional files as well. To install the software you would double-click on the setup.exe file to launch the setup package, and then it would prompt you with a series of windows where you have to make various selections including but not limited to the desired path for the installation. You have to click ‘Next’ usually at least a few times before the process will actually start. You might even be required to click on something in the middle of the installation before it will complete. It all just depends on the particular package in question. If you plan to install the software package on numerous computers, one obvious way to do it is by simply manually connecting to each target computer and then running the setup.exe, clicking ‘Next’ however many times is required, and eventually completing the installation process on each computer. However, if you want to more easily, quickly, and painlessly deploy the software to multiple computers, you need to determine how to install the package silently or quietly. Essentially a “silent” or “quiet” installation is one where after launching the process, it completes with no further interaction required. That is to say you do not need to click ‘Next’ or any other button to complete the installation. Instead, you give all of the information required for the installation up front, typically in the form of installation parameters or switches, so that the package can do its thing without any further instructions or interaction. It’s called a “silent” or “quiet” installation because the installation process runs without making “noise.” In this case the “noise” would be various dialog windows that require user input such as clicking ‘Next’ or ‘Finish’ or entering an installation path or some other information that the installer requests. When you determine how to execute a silent installation, you can simply execute a particular command from the cmd prompt, and this command will be sufficient for the installer package to run to completion with no further interaction. How to determine the silent installation parameter for a package? This entry was posted in Blog, General, Tutorials and tagged remote deployment, silent, software deployment, Windows Updates. Bookmark the permalink. Both comments and trackbacks are currently closed.